When I wrote this, I was thinking about: Apple, Design. Ever since Apple sent out the invites for the January 27th event, rumoured to be a tablet reveal, people have been dissecting the design of the invitation trying to gain some insight. There is a history of this activity, but from memory I can’t remember any accurate information being derived from an invitation. But just to confirm my suspicion, I scoured the web to find any Apple Event invitations and then compared them against the actual announcements made at that event. I’ve collated the information I discovered here and listed them in ascending date order. This is the earliest Apple Special invite I could find. Very clearly aimed at the music market, and carrying heavy iPod branding this event was rumoured to be an unveiling of iTunes for Windows, and that’s exactly what it was. It’s easy to understate the importance of this event but in Apple’s recent history, it’s one of the biggest. Porting iTunes to Windows allowed iPods to work with Windows, the biggest operating system on the planet. It was at this point the iPod leapt from a niche product to a mainstream darling. Image Source. 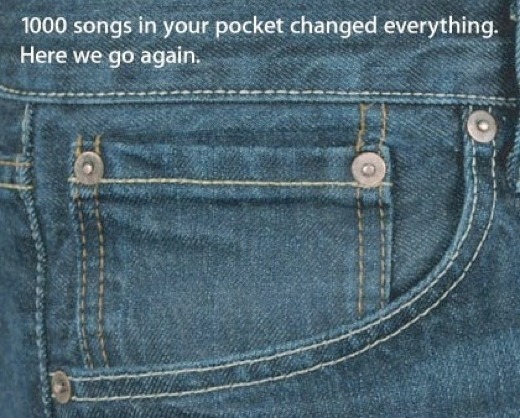 1000 Songs in your pocket changed everything. Here we go again. With hindsight, you could chose to read quite a lot into this invite. Like the previous invite, this is clearly aimed at the iTunes / iPod ecosystem. 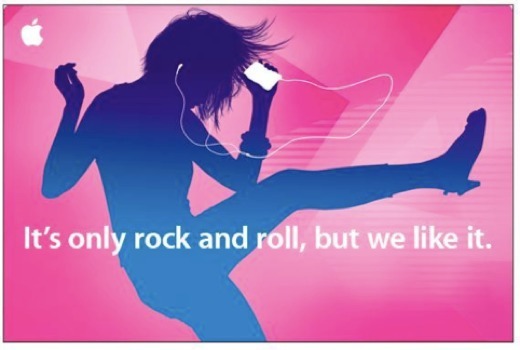 Looking at the image used in the invitation you might like to assume that the iPod at the time would have fitted into the pocket in the jeans. You might also like to assume that the iPod Nano would fit into the smaller pocket also present in the picture. It was the iPod Nano that was the announced at this event. This event was also noteworthy for the release of the original iPhone. Well, the Motorola ROKR E1, the ill fated first phone to integrate with iTunes. This collaboration really didn’t deliver what users wanted from an Apple Phone, or even a phone that was capable of linking to iTunes. Image Source. If you had to choose one word to describe the theme of this invite, it would probably be some variation of “show”. 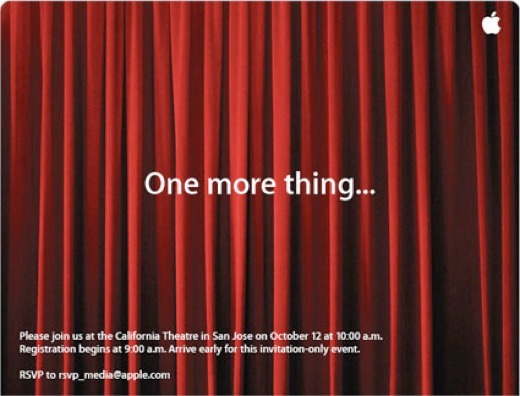 The “One more thing…” tagline, a staple of Apple events that sets its announcements apart from other companies because of it’s showmanship, and the theatre curtains, both point to a show or a performance. It is therefore a tad surprising that the rumours circulating around the time of this event were so mundane. An updated G5 tower and G4 PowerBooks, whilst important to the core Apple user base, aren’t terribly exciting. What’s less surprising is that all the announcements were related, at least tenuously, with performances, visual performances. We had the first iMac to come with an iSight camera built in, the first video iPod and iTunes version 6. Image Source. Come see some fun new products from Apple. As far back as I can remember, this was the strangest and most disappointing Apple event of recent times. In sharp contrast to the previous event (12t October 2005), the rumours were far more exciting than the actual reveals. People were expecting what we now know is the iPod Touch and some of the first Intel powered iBooks, but instead they got the Apple Hi-Fi and a Mac Mini Core Duo. If the last event could be summed up with “Show” I think this one could be summed up with “Meh”. Image Source. 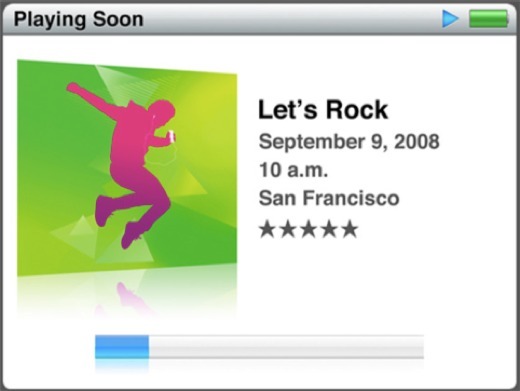 In a similar vein to the “One more thing…” invitation, this was clearly aimed at the iTunes ecosystem (with a general theme of entertainment) and it notable for having one of the few reveals that truly came out of left field, the Apple TV (or iTV as it was originally named at this event). We also saw iTunes 7 and second generations of the iPod Nano and the iPod Shuffle. Image Source. 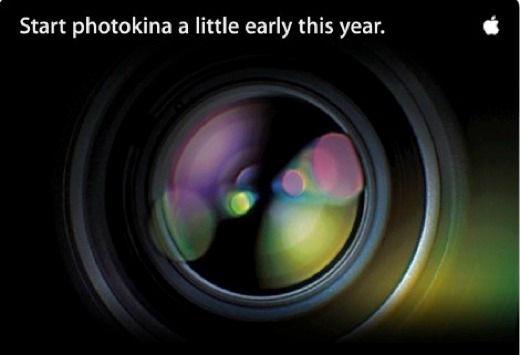 Start photokina a little early this year. This invite was sent out very shortly after the previous invite (“It’s Showtime”, above) and the event was only a week or so later. There was no mystery at all to this particular event, held at the photokina photography event, and clearly referencing Aperture, everyone knew what was coming. This was the announcement, and almost immediate release, of Aperture version 1.5. Probably more important than the even itself was the ability to download a trial of Aperture 1.5 a week later, and a very quick turnaround on a patch barely a week later again. Image Source. Much like the Photokina event above, this invite was related to the NAB event in 2007. Many in the industry hailed some of the Apple products announced at this special event as revolutionary. The headliners were Final Cut Studio 4 and Final Cut Server. Final Cut Server especially was an insightful move by Apple, given the direction media creators were heading in, namely to distributed computer systems with share libraries and resources. We also saw the introduction of some very specific stand-alone technologies and products, like Apple ProRes, Motion 3 and Color. A very specific, focus presentation to a very specific audience. The invitation clearly pointed towards the content contained within. Image Source. The rumours prior to this event were pretty accurate. Many people were eagerly expecting a phone-less iPhone, and we got the iPod Touch. I’ll also remember this event for the release of the rather oddly shaped iPod Nano, the square one. We also got the iPod Classic, with its huge storage capacity, and to accompany the iPod Touch, the WiFi iTunes store. 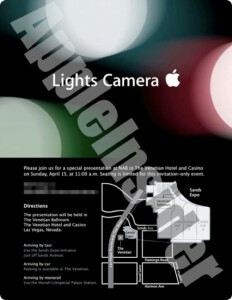 As seems to be the way, this iPod focused event got an iPod focused invitation. Apple left no doubt in anyone’s mind as to what the topic of conversation was going to be. Image Source. A landmark event. In more ways than one. 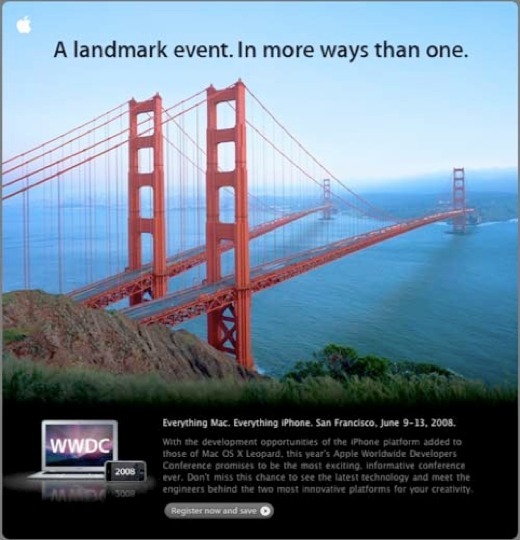 Whilst not really a special event, this invite was sent out for the keynote that kicked off WWDC 2008. I wanted to include it because I thought the imagery used matched the keynote itself. The images used in the invite has the Golden Gate Bridge in San Francisco duplicated and heading to two different locations. The keynote was similarly split into two. The first half was concentrated almost entirely around the iPhone SDK and even included a demonstration on stage of a basic application being built. The second half of the keynote was far more consumer orientated and included the revealing of Mobile Me and the iPhone 3G. I don’t think too much can be read into the invitation here as it was certainly more about the entire WWDC event rather than just the keynote. 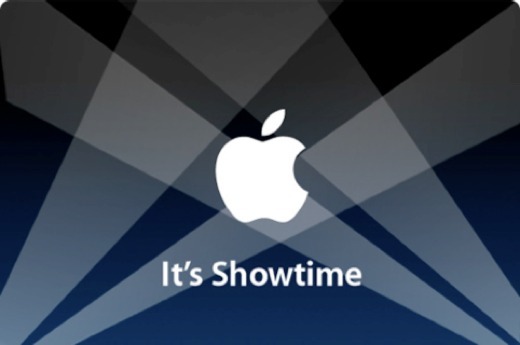 I just liked the way the imagery used mirrored the keynote, whether it was intentional or not. Image Source. Well, that certainly looks like an iPod interface, doesn’t it? 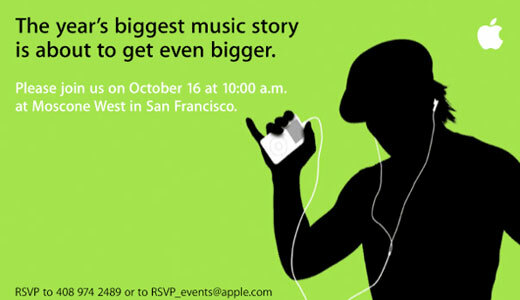 The timing of this event combined with this invitation once again left no doubt as to the topic of the event, iPods. At this one we got the second generation iPod Touch, the fourth generation iPod Nano as well as a new version of iTunes (v8) complete with HD movies. Image Source. 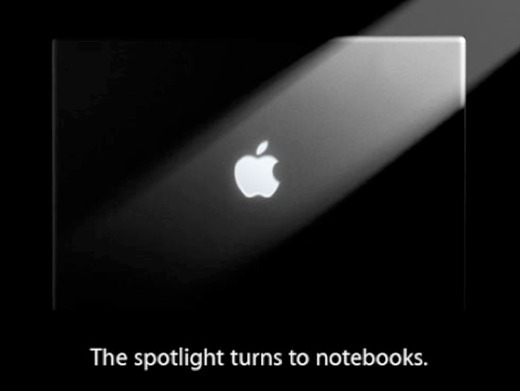 The spotlight turns to notebooks. Looking through this list, it sort of feels like Apple’s lost a bit of the adventure some of the early events had. Through the years it appears as if the invitations are getting less and less vague. Apple is setting more realistic expectations. No doubt this has something to do with their greater size and exposure to the stock market, which hangs on every event, watching, judging. The rumours preceding this event were mostly centered around new sized notebooks. In fact, people were so keen to get the details down you’ll find images online where people have attempted to extrapolate the size of the notebook in the invitation from the relative size of the Apple logo. The products were, however, rather more mundane. We simply got updated versions of the MacBook Pro, MacBook Air, MacBook and the new 24″ Cinema Display that’s designed for notebooks. Image Source. It's only rock and roll, but we like it. 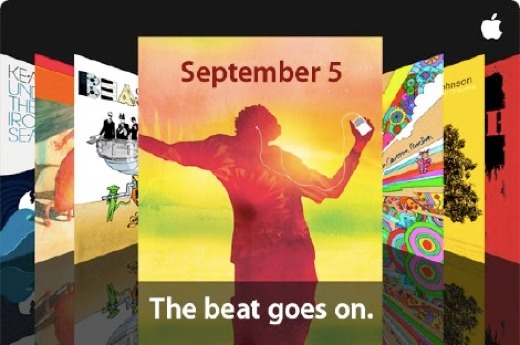 It seems that Apple events around the September 10th (7th in 2005, 12th in 2006, 5th in 2007, 9th in 2008 and 9th again in 2009) always focus on their iPod holiday line-up. It makes sense from a business perspective and we all know what to expect. Hence Apple doesn’t even attempt to add any mystery to these events at all. Even as these events go, this was a fairly low key affair. We got some new colours for the iPod Shuffle, iTunes 9 and updated iPod Touches and Nanos. Quite unspectacular. Image Source. Come see our latest creation. And here we are, up to date. We don’t know what Apple will reveal on the 27th, but everyone is suspecting it to be a tablet computer or device of some sort. You can read an article I wrote covering some usability issues Apple will have to overcome here. Image Source. Now we’ve collected some of the invites sent, can we extract any trends from the data? Well yes and no. There are certain events for which Apple seems comfortable to divulge the topic of conversation before hand. The iPod events are an example of this, they very rarely deviate from the iPod branding leaving no doubt that it’s an iPod event you’re going to. We’ve also seen some examples of Apple being very explicit with other events. The MacBook event for one. It’s fun to speculate why they do this, but I suspect the reason is that they need to set realistic expectations before hand. Since the launch, and subsequent success of, the iPod, Apple has been thrust into the spotlight. As I touched on earlier, they’re a mainstream electronics company now, not a niche computer manufacturer. The difference may sound minor (pedantic, even), but it’s not. Apple showed with the iPhone that they can, in one move, change an industry. They’ve done it three times. Analysts and Market Watchers expect them to do this every time. Let’s take an example, the MacBook event on 14th October 2008. Even back as far as then there were rampant rumours of a touchscreen device, a tablet. If Apple had phrased the invite “We’re changing mobile computing forever”, or something with an equal amount of pomp an drama (and ambiguity), this speculation would have grown. And when speculation grows, so does expectation. If speculation had grown to the point it’s currently at, and Apple had just released a fairly minor MacBook refresh, the disappointment would have been crushing and no doubt their stock market price would have taken a beating. But instead, Apple told everyone exactly what they were going to be talking about, and then delivered in line with those expectations. 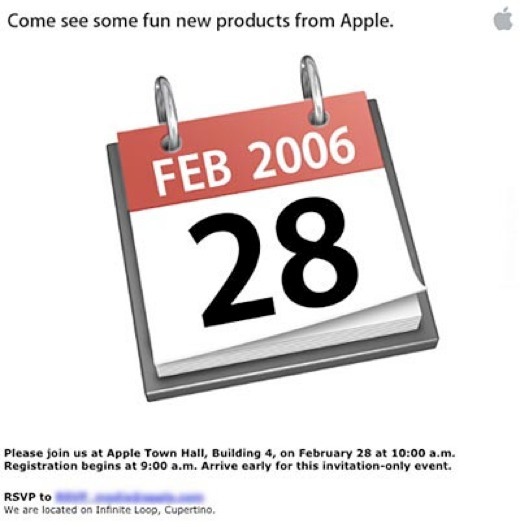 Looking back over these invites, and the events they represent, I can only really remember one where Apple failed to meet expectations (February 28th 2006). That’s quite an accomplishment. That brings us on to the tablet event, so let’s look at it in a little more detail, taking into account the things we’ve learned from past events. “Come see our latest creation.” is a vague and inviting tagline. There’s a relaxed feel to the copy that isn’t unheard of for Apple events. You’ll also notice that “creation” is used in the singular, rather than the plural. Not since the original iPod event can I remember an Apple special event that focused solely on a single product. You’ll note that the biggest announcement of recent times, the original iPhone at MacWorld 2007, followed a fairly lengthy section on the Apple TV. As far as we know, there’s little play on words that Apple has been fond of in the past. The MacBook Air release (MacWorld 2008) was accompanied by banners stating “There’s something in the air”, which lead people to suspect some sort of cloud based service, possibly for media. However, it was altogether more blatant than that. There is also a distinct lack of hyperbole from this invitation. This may be down to managing expectations, as I’ve discussed previously, or it may be to allow for some vagueness and ambiguity. To add some hyperbole you also need to add some specifics. Like the iPod invitation of 7th September 2005, they are clearly hinting that it’s mobile music consumption that’s changing. This doesn’t prevent Steve Jobs from throwing in some hyperbole during the event though, much like his “Today we’re going to make history together” statement before unveiling the iPhone. The wording does compliment the overall theme of the invite though. I don’t think it’s difficult to pick a theme for this invite. If I had to sum it up in one word, it would be “creativity”. We have the use of the word “creation”, rather than product or device (neither of which sound particularly Apple, but have been used in the past) which conjures certain images and feelings. It’s not something that’s been engineered, or manufactured, but rather something that’s been created lovingly. Then we’ve got the paint splatters that appear to be breaking out of some sort of boundary (thin, grey lines around the outside of the invite). If you think of an audience that this is aimed at, one would be hard pressed to disagree that it’s the creative community. The arty splatters, the breaking out of boundaries, the colour and the words. The paint splatters breaking out of the boundary could also be seen as Apple signalling that they’re about to do something other manufacturers in the industry aren’t doing. They are breaking the mould. Based purely on the invitation, I think it’ll be fun to speculate on what we’ll see in the event. Rather than specific products, I want to think about the words that will be used and the themes. 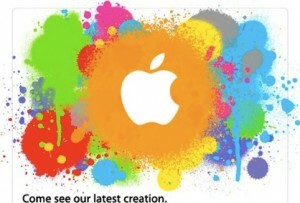 Based purely on the boundary part of the invite’s design, I would expect to see Apple talking about creating a new market segment. They’ll push whatever it is they’re hawking as something that’s never been done before. Incomparable to existing products. I think there’ll also be an element of selling it to creatives. Apple has a long standing reputation as being the computer of choice for creative professionals (artists, photographers, graphic designers etc. ), and I think they’ll play heavily on this. I would imagine that they’ve thought through some use cases to demonstrate (this is a favourite of Steve Jobs, he likes to run through scenarios on stage – remember the call to Starbucks during the MacWorld 2007 iPhone keynote? ), and I wouldn’t be surprised if they included some form of content creation, rather than just consumption. And here’s the key concept I think will run through the event. There are many tablets out there but the use cases are limited. They are mostly used for content consumption because the inputs aren’t up to scratch (crippled keyboard, stylii etc.). Apple will create a device that can be used as much for content creation as consumption. Of course, that’s reading a lot into an invite. Probably too much. And I wouldn’t be at all surprised if I was 100% wrong on everything. But isn’t speculation fun? If you know of any invites I’ve missed out, please let me know and I’ll add them to this Apple Special Event Invitation Gallery. Thanks. So what do you think? Can we read anything into the invite? Does it follow a clear trend, or not? Let us know in the comments. There are 2 responses so far. View them below and add your own using the form at the bottom of the page. It’s going to be a new photoshop/illustrator software suite to compete with adobe?